Before the eventual collapse of the Roman empire in the 5th century, their superbly trained armies had won battles and territory in Europe, Central Asia and North Africa for 500 years; Roma Legion Xtreme is an online slot which reflects their history and glory, it’s developed by Gamomat and you can read all about it here. 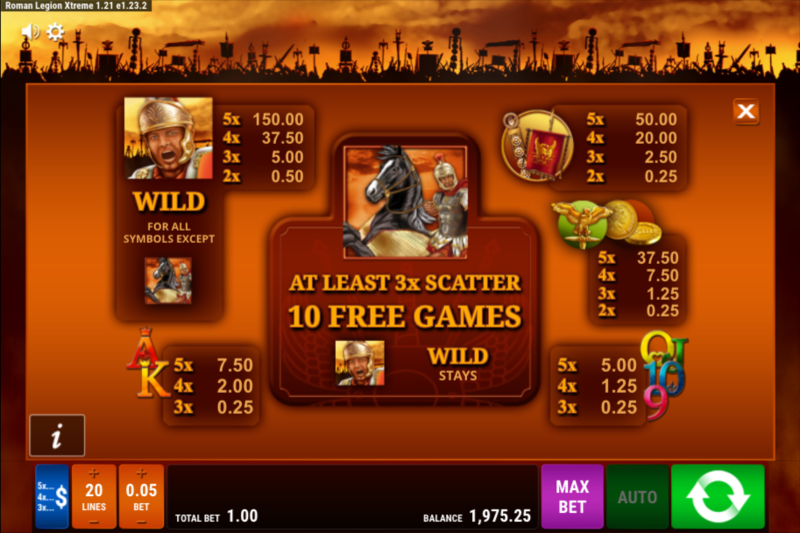 Roman Legion Xtreme is a five reel slot with three rows and five paylines; however, as you can see from the screenshot above there’s a main set of reels and then a longer set on the right. The right hand side set is essentially three sets on top of one another and there is no connection between the right and left sets, except when collecting scatter icons. Various Roman symbols represent the higher value symbols and these include the standards or various legions such as the famous golden eagle and a stack of gold coins; 9, 10, J, Q, K and A make up the lower values. The warlike legionary is the wild symbol and he will substitute for all others to make a winning combo except for soldier on horseback scatter. This is triggered by landing three or more of the soldier on horseback scatter symbols anywhere on the reels; there’s no extra multiplier for any wins here but whenever a wild soldier lands he will remain in place there until the round ends. It’s not possible to trigger any more spins from within this feature. Ladder – Try and work your way up the cash ladder for bigger prizes but dropping to the bottom and winning nothing. Cards – Click the red or black buttons to guess what’s under the bigger card and double your win. 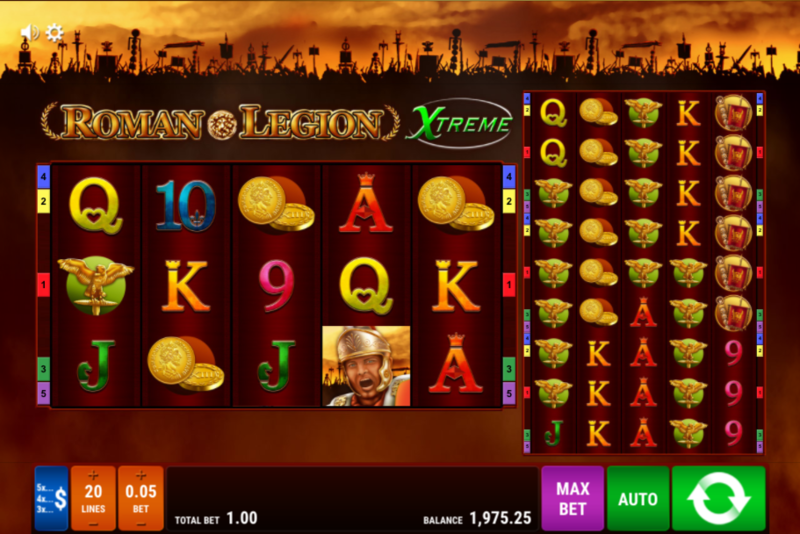 Roman Legion Xtreme is a perfectly adequate slot with plenty of opportunities to win and a regularly-triggered free spins round; it comes with an RTP ranging between 91.90% and 96.10% and a choice of gamble features.